I’ve gone a little stipple crazy here lately. I stippled coffee mugs last week and this week I’m making DIY Stipple Easter Eggs! It only took me about 45 minutes to make these four eggs and the process was really simple! You could easily give these as gifts to your guests at Easter Brunch, hang them from a tree in your yard, use them as place settings. So may options! 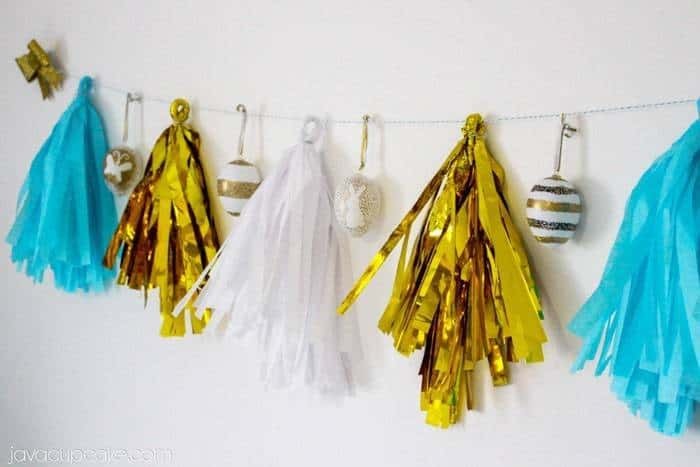 I hung these in my office on my tassel garland. I think they’re adorable! I got a 6 pack of plastic eggs for €1 at the Nuremberg Easter Market, but I’m certain you can get them at any craft store in the US. If you don’t have paint markets, use Sharpies. If you don’t have a template, freehand it! The great thing about these eggs is that they don’t have to be perfect to be beautiful! Different colors, different patters… the possibilities are endless! Clean the egg off with a cotton ball wet with rubbing alcohol. Allow to dry. FOR THE EGGS with PATTERNS: Print the pattern and cut it out. Apply the glue to the back of the pattern and place it on the egg where you like it. Stipple around the pattern. Apple more dots closer and denser near the pattern. 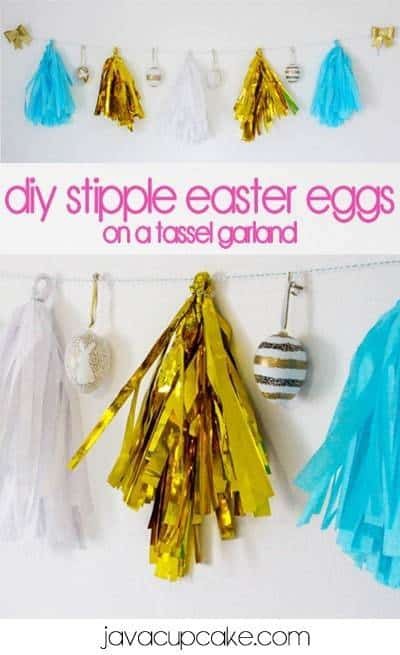 FOR THE EGGS with STRIPES: Place masking tape around the entire egg. Using your knife or blade, score the tape in strips and peel off the tape. Stipple with the paint markers between the tape strips. Make sure to stipple in a uniform manner making sure to fill in any blank spaces. FOR ALL PATTERNS: Allow the paint to dry before removing the pattern/tape. About 2 minutes. Once the pattern has been removed, use the knife to get an excess glue or paper off the egg. Dip a q-tip in rubbing alcohol and clean off any excess glue or tape. You can also rub off any unwanted paint… gently making sure not to smear what you do want. Attach a piece of string or elastic to the hook and tie a knot to secure a loop. 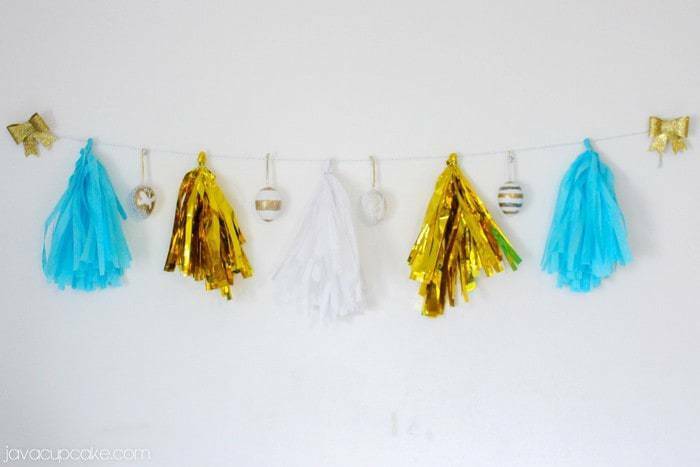 I hung these eggs on a DIY tassel garland that I made for my office. But you could hang yours anywhere! The possibilities are endless!